We love to drink eggnog during the holidays, and I also love to bake with it. The regular kind of eggnog (no alcohol) you buy at the grocery store is so delicious and creamy. I adore the warm spiced taste and how it flavors up all kinds of my favorite treats. 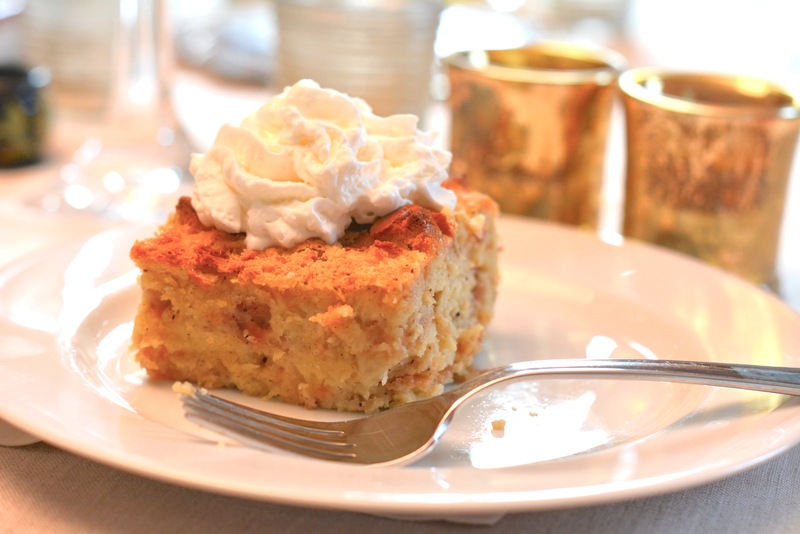 Lately we’ve been really into eggnog bread pudding. I prepare it in advance and bake it up in the morning for breakfast. Or I serve at the end of a dinner party and it becomes the crowning dessert of the holidays. I can’t tell you quite how amazing it tastes—warm and creamy with lots of cinnamon. It is even better when it is topped with whipped cream! Step 2: In a large bowl beat the eggnog, cooled butter, vanilla, eggs, and sugar until completely combined. Step 3: Stuff the bread into a 9x9 glass baking dish that has been lightly sprayed with cooking spray. Pour the eggnog mixture carefully over the bread so it absorbs into the bread completely. Press it down with a spoon so the bread is compact. Step 4: Bake the pudding for 45 to 50 minutes, or until a knife inserted into the center comes out clean. Allow to cool for 10 minutes. Slice and serve with whipped cream.